After the sun goes down, these Pittsburghers are on the clock keeping the lights on, stocking the shelves, and cleaning offices and hospitals. But at 4 a.m., it can be a struggle to keep the economy rolling. The deserted expanse of parking lot at 1:30 a.m. was blanketed in silence and riddled with patches of darkness. Rising about 30 feet in one of those dark patches, Tom Whyel screwed a watermelon-sized bulb into a light fixture. It flickered to life, casting a white metal-halite glow onto the parking spaces at the Wilkinsburg Park and Ride. “Let there be light!” he bellowed triumphantly, at no one in particular, his voice carrying beyond the empty buildings. Over a three-month period, the Post-Gazette followed employees who work nights for Duquesne Light, Giant Eagle, Haemonetics, UPMC, Platinum Cleaning and the Port Authority of Allegheny County. They shared the impact on their lives and what drives them to accept a shift many would not want. Their stories are woven together here to illustrate a typical night. Despite his nighttime invisibility to most of the city, he was not alone out there. Hundreds of people — spread among an array of industries and pay grades — regularly work around Pittsburgh through the deadest of hours. They are a peculiar subset of the workforce, occupying jobs that, by the very nature of the timing, are critical for companies, public safety and the lifeblood of the regional economy. 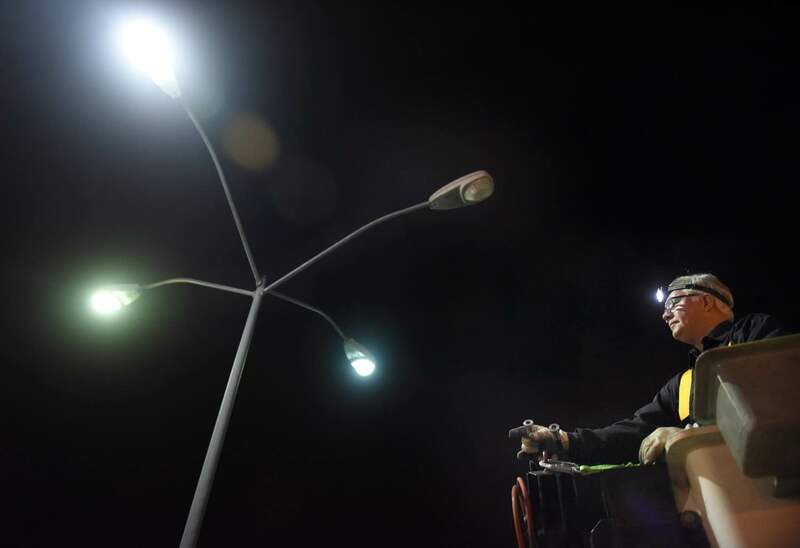 Tom Whyel, an overnight worker for the Port Authority of Allegheny County, replaces burnt bulbs at a Port Authority parking lot in Wilkinsburg. 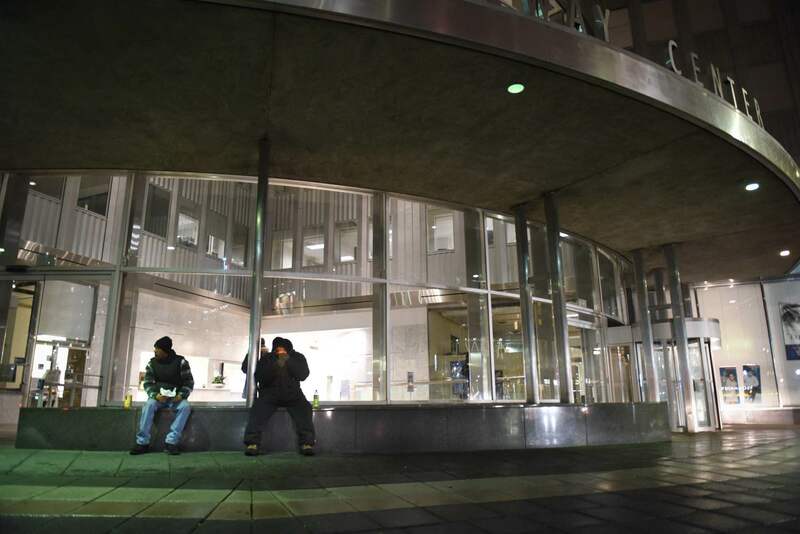 In interviews and job visits with the Pittsburgh Post-Gazette in recent months, night shift employees described their work as being carried out in a different dimension — one that contains just them and their duties. The prolonged calm can make them more productive and happier employees, they said. Many shunned the rigid 9-to-5 routine in exchange for the flexibility to go to school during daylight hours or to have time with their children. Sometimes the night shift is part of just making ends meet. At the same time, the workers of the night acknowledged that the shift inflicts an incalculable physical and emotional toll. The American Academy of Sleep Medicine even has a name for it: shift worker disorder — a special strain of fatigue that doctors say can lead to poor concentration, accidents, injuries and fatalities in industries that can ill afford on-the-job mistakes. But such analysis is for other people. By the end of the night, shift workers in industries such as transportation, health care, public safety and utilities have handled what has to be done. Not long after their son, Joshua, gets home from school, Barb and Russ Greshauk head to work 12-hour overnight shifts at Haemonetics in Leetsdale. Barb and Russ Greshauk woke to a bright and gusty afternoon, large-limbed trees waving over the home they built in rural Beaver County. They consider themselves lucky to get six hours of rest; some days, they are kept awake by any number of tasks on their 6-acre property. But a relatively long sleep means there is no time left to waste. Russ ventured outside to walk their dog, while Barb began mulling lunch options for the crockpot as she headed to retrieve their 9-year-old son, Joshua, from the school bus — the only indication for her that it was a weekday. This evening, she decided, it will be sausages. By 4:30 p.m., the sausages were cooked and Joshua fed and content. Russ poured coffee into a thermos. There was a rare pause in the kitchen. Barb and Russ Greshauk with son Joshua at the family's Independence home shortly before the couple leave to work overnight shifts at Haemonetics in Leetsdale. For about 15 years, the couple has worked for Haemonetics, a manufacturer of so-called blood management devices — plastic bowls, bottles and other equipment that help hospitals and plasma centers test and contain patients’ blood. 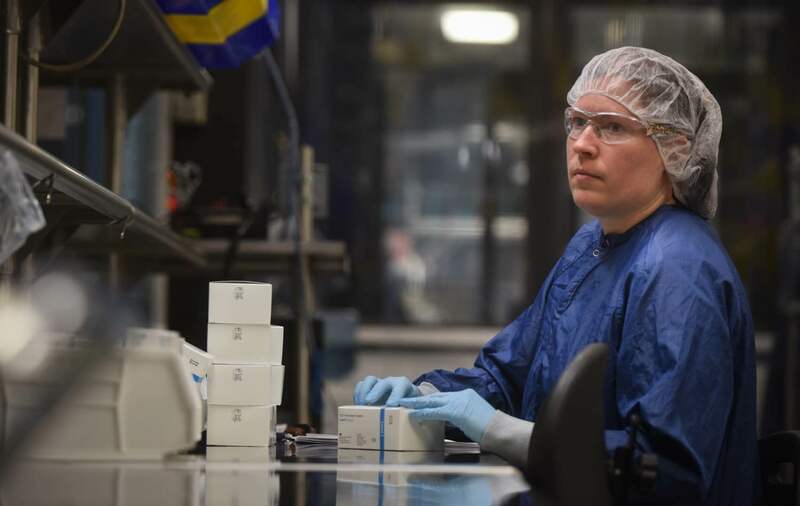 With strong demand from the booming health care industry, Haemonetics churns out plastic products at all hours at its plant in Leetsdale. Barb, a quality technician, and Russ, a mechanic, have worked the night shift nearly the entire time, most recently moving to 12-hour shifts — 6 p.m. to 6 a.m.
Their schedule is “consistently inconsistent,” Russ explained with a laugh. 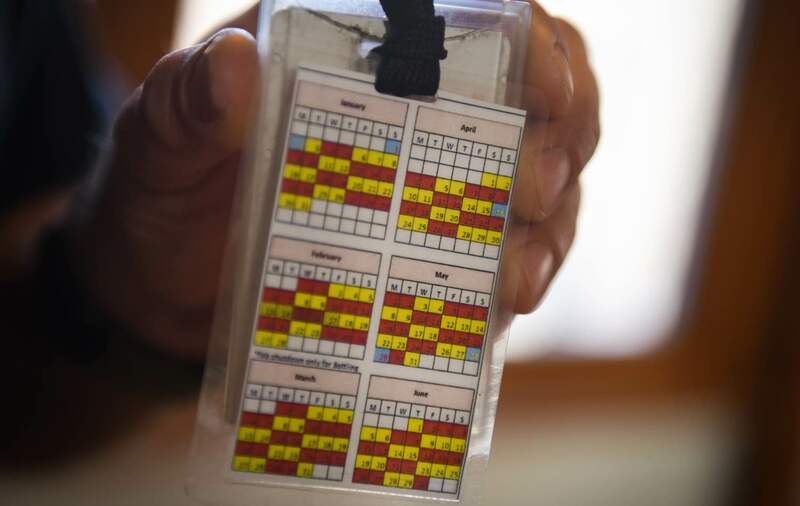 He showed off the lanyard with a pocket-size calendar for March filled in with red and yellow. As yellow team members, they work alternating periods of two, three and two days — meaning they work two days, then take off two; work three days, then take off two; work two days, then take off three; and it repeats. In manufacturing, the more you produce, the more business you get. Outside of trucking and warehousing jobs — which move products from factories — the nation’s manufacturing sector has the highest portion of its workforce clocked in at night, according to the U.S. Bureau of Labor Statistics. 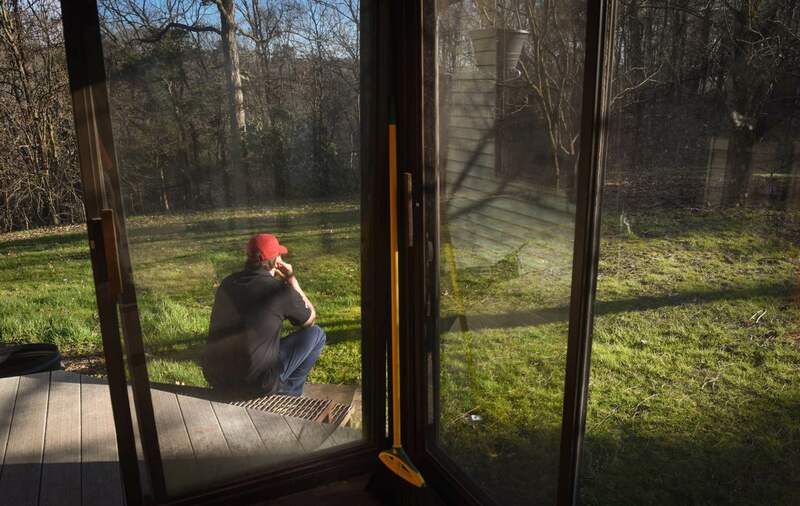 Russ Greshauk takes a phone call at his family's home, which he built with his wife on a ridge in Independence during their days free from work. Russ Greshauk displays a card with his work schedule. The Greshauks each possess organic energy that feeds off the other. They point to many of their life accomplishments as a function of working nights. For one, their seven-year marriage originated on the Haemonetics’ factory floor. By that time, Barb, with a young son from a previous marriage, had earned a bachelor of science in organizational studies from Robert Morris University, using the company’s tuition reimbursement program to offset the cost. After that 15-minute breather in the kitchen, Russ got a call: Joshua’s nightly babysitter, Barb’s nephew Danny, was ready to be picked up. By 5:10 p.m., they hugged Joshua good night and began a 30-minute commute along winding back roads to Leetsdale. Arlynna Evans, a nighttime cleaner at UPMC Mercy Hospital, tries to have dinner on the table every day by 6 p.m. Earlier in the day, she takes her 3-year-old son KickingBear on a trail along the Monongahela River on Pittsburgh's South Side to blow off steam. A day with KickingBear is as exhausting as it sounds. The spunky 3-year-old child is a furious ball of energy that suggests a bright future in the spirited powwows that he attends with his parents each year. On an unusually warm February afternoon, KickingBear and his mother, Arlynna Evans, were at their favorite spot to get fresh air and blow off steam: Riverfront Park in the South Side. He wore a Pirates cap on his bushy hair and a toy amulet around his neck — the stolen heart of Te Fiti from “Moana,” the Disney cartoon flick about a daring Polynesian teenager who sets sail to fulfill her native ancestors’ unfinished quest. “I didn’t expect them to explore the culture as much as they did,” Ms. Evans said of the movie, panting under the weight of carrying KickingBear on her back. Ms. Evans is of Cherokee and Blackfoot heritage, and her husband has North Dakota Sioux and Ute in his blood. She has plenty of time to raise her son how she chooses, she explained. After a mile or so of walking, she stops at a clearing in the riverside trees and gestures out across the Monongahela River. UPMC Mercy, perched on the Uptown bluff, is where she spends her nights as a cleaner so she can spend her days with KickingBear. But all that time with her child comes with a trade-off: By her account, she rarely sleeps. “As soon as he’s preoccupied with something, I can get in a nap,” she said. Otherwise, she will stay awake for entire days at a time. That’s how Ms. Evans’ mother — who also works as a nighttime cleaner at UPMC Mercy — raised her, she said, and it’s worth making the sacrifice for family. Hospitals, needed to support an aging population, have pulled more workers, outside of direct medical staff, into the health care industry. The government estimates 61,130 cleaners work in hospitals nationwide, earning on average $13.50 an hour. Ms. Evans started at $9 an hour, although UPMC health system announced last year it will raise entry wages to $15 an hour. The Service Employees International Union has been pushing to represent workers at the region’s largest employer. 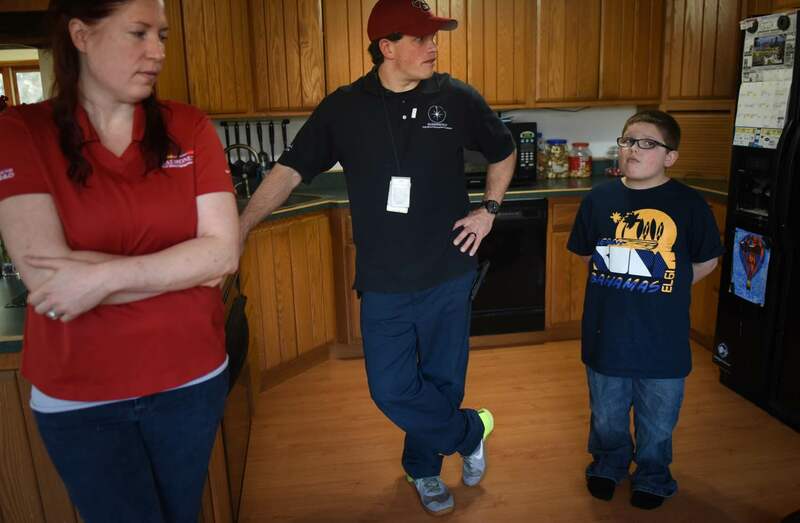 Each day, Ms. Evans’ goal is to have dinner on the table by 6 p.m. for her husband and son. KickingBear falls asleep around 8 p.m. Her husband arrives back at their home in Etna by then and the two spend some brief quiet time together. Ms. Evans arrives at the hospital just before 10 p.m. She drops off her things in a locker room and checks in with her superiors, who sometimes dare state aloud that it may be an easy night. In reality, the pacing of her shift hinges largely on Pittsburghers’ capacity for serious injury. On some nights — particularly on celebratory holidays — she races through the facility, skipping breaks to sterilize rooms ahead of people coming in wounded by gunshots, stabbings and grotesque accidents. Staffing issues have caused mayhem at times, she said. For a while, she was the only cleaner working around the emergency room on the weekends; on busy nights, she cleaned close to 30 rooms. A few blocks from his McKees Rocks home, Steve Kelley waits for a bus that will take him to his night job at Gateway Center in downtown Pittsburgh. The man of the hour comes lumbering down the steps of his new McKees Rocks home with heavy eyes and a grin. The 52-year-old hasn’t had an upstairs in his home since he was a little kid, so his wife, Rhonda, greets her husband’s emergence from the stairwell each evening at 8 p.m. with some pomp. “I can always hear the music” of the late-night television shows, Mr. Kelley said. But tonight, he said, he wishes for a backup host. Forecasters have warned of heavy snow overnight, which translates to overtime for Mr. Kelley, who cleans up after about 300 people who work in Four Gateway Center in Downtown. 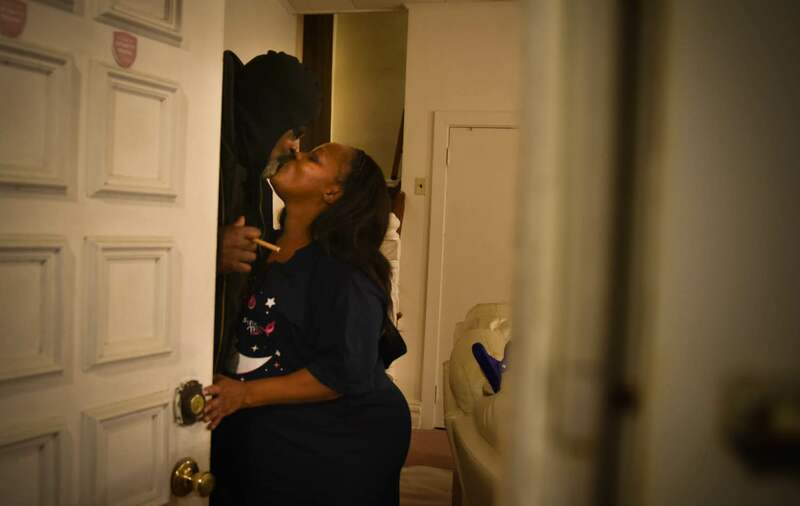 Steve Kelley kisses wife Rhonda goodbye as he leaves his McKees Rocks home. Steve Kelley rides a bus from his McKees Rocks. A janitor with Platinum Group Services LLC, Mr. Kelley is also on the hook to shovel snow around the building before the morning commute. So, a snowstorm can add at least an hour onto his shift. And with only about four hours of sleep on this day — Rhonda had a doctor’s appointment in the afternoon — “I’m destroyed,” he said, sporting a hefty, full-body snow suit. 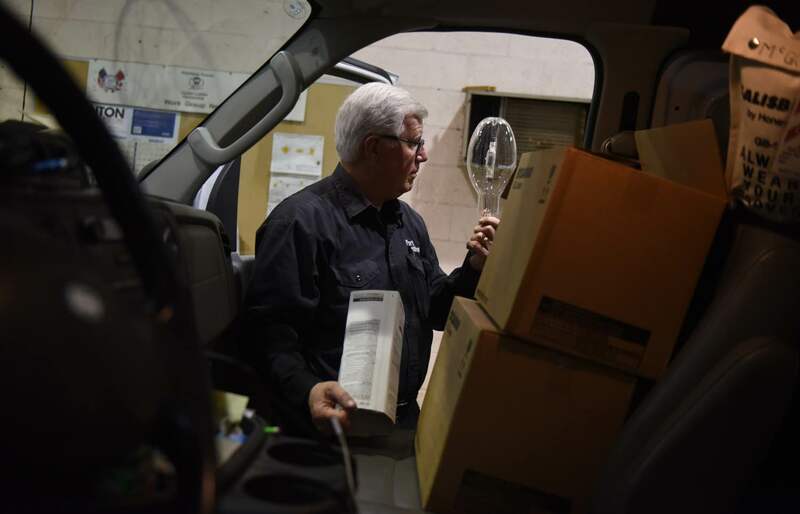 Mr. Kelley is a rare breed of worker, a self-proclaimed “night shift guy” who sought out the late shift because he prefers the desert of cubicles to working around other people. From the 17th to 19th floor, he vacuums large swaths of carpet, empties trash, dusts surfaces and tidies the hallways. Steve Kelley of McKees Rocks lights a cigar and waits for his shift to begin as a building cleaner at Gateway Center in downtown Pittsburgh. He hugged Rhonda goodbye around 8:45 p.m. and was off to the Chartiers Avenue bus stop. The snow began to fall in sheets of white, making his walk down the neighborhood’s steep-sloped brick streets treacherous. With time to spare until the No. 24 bus arrived, he ducked into the nearby Family Dollar to grab the Mountain Dew — and its 91 milligrams of caffeine — that serves as his initial fuel for the night. Later, coffee and a few Black and Mild cigars will sustain him. “It’s the work itself that wears you out because there’s so much of it,” he said. 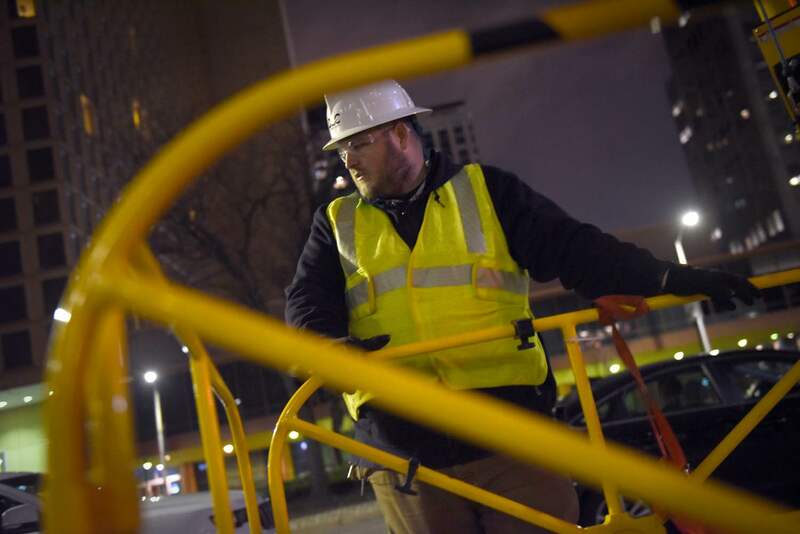 Shane Thieret, underground supervisor for Duquesne Light Co., works in a vault at the intersection of Liberty Avenue and Commonwealth Place, Downtown. Not far from where Mr. Kelley usually waits for his shift to start, Shane Thieret gathered his guys together around an unassuming metal grate in the sidewalk. As an underground supervisor for Duquesne Light Co., Mr. Thieret oversees maintenance on the electric utility’s power infrastructure Downtown. Beneath Pittsburgh’s commercial district, in which an estimated 109,000 people work, is a spiderweb of high-voltage power cables with layers of redundancy, Mr. Thieret explained. That means multiple lines feed each Downtown building, so if one line were to fail, another would automatically pick up. 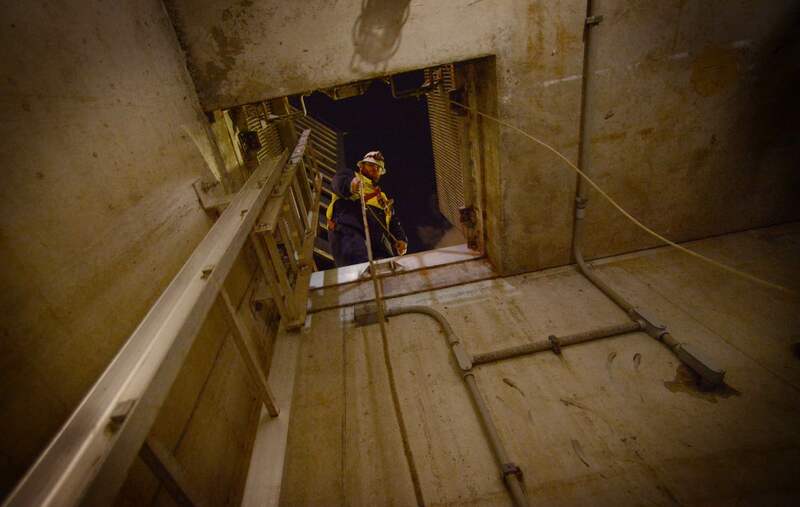 Shane Thieret, underground supervisor for Duquesne Light Co., prepares to perform maintenance in a vault at the intersection of Liberty Avenue and Commonwealth Place, Downtown. To manage the flow of power, Duquesne Light maintains more than 600 transformers and circuit breakers installed within skyscrapers and in gritty vaults underground. The transformers step down the electricity from 22,000 volts to 125 volts. The circuit breaker, attached to the side of the transformer, is “essentially a giant automatic switch,” opening and closing to send power to the building as necessary. The 28-year-old went to a tech school for heating, ventilation and air-conditioning repair. After realizing he didn’t enjoy the work and the travel that came with it, he made the leap to Duquesne Light, where his father works as a trainer. He started out as a janitor while he learned the trade at the company’s training center, becoming familiar with the large-scale breakers that control the tremendous flow of power into commercial buildings. The utility checks the equipment every three years, which means nighttime crews can visit as many as 100 pieces of equipment scattered under Downtown each year. Due to the high traffic and power demand during the day, the maintenance is saved for the night crew, Mr. Thieret said. That night, after leading a daily safety briefing at the company’s Preble Service Center on the North Side, Mr. Thieret took his crew to the River Vue apartments on Liberty Avenue, a building with four underground transformers. 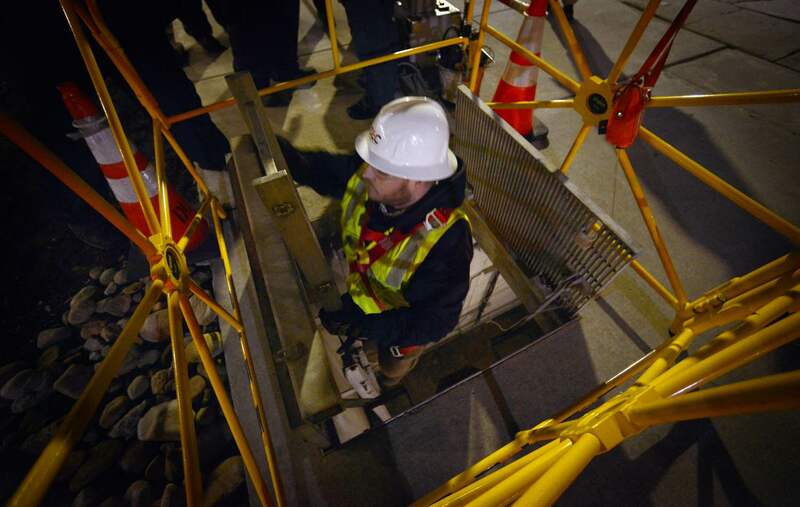 Shane Thieret, underground supervisor for Duquesne Light Co., emerges from a vault at the intersection of Liberty Avenue and Commonwealth Place, Downtown. A Duquesne Light Co. employee lowers a line to workers in a vault at the intersection of Liberty Avenue and Commonwealth Place, Downtown. It took time to set up a site. Crew members lifted a section of the grate built into the sidewalk and cordoned it off with a pulley system attached to their harnesses. Some joyous Penguins fans streamed around the crew, oblivious to the work as they headed home after a game in Uptown. The company requires one worker to stand guard at the top of the grate, Mr. Thieret said, as crowds bumping into work can pose a danger. Before entering, the crew tested for poisonous gases that can stray from other underground pipes or passing vehicles and hover in the vault. They looked for pools of standing water that would need to be pumped out. If the whole thing would need to be replaced, the crews bring in a crane: The transformer and breaker together are the size of a truck and weigh 12,000 pounds. 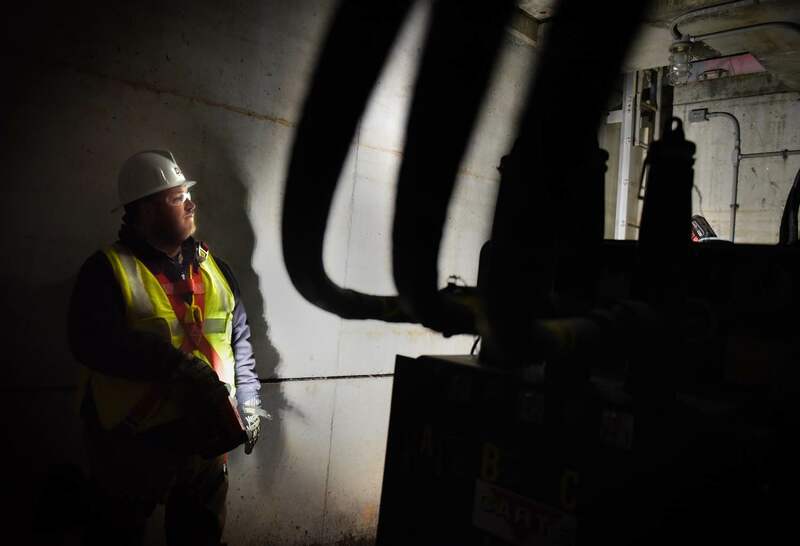 Shane Thieret, underground supervisor for Duquesne Light Co., checks out a transformer in a vault at the intersection of Liberty Avenue and Commonwealth Place, Downtown. From the setup to the drive back to the North Side, Mr. Thieret said, one maintenance job typically takes six hours. Married without children, he heads straight to bed after getting off at 5 a.m. and has no problem getting a solid six hours of sleep. Just after midnight at Haemonetics, Russ Greshauk can be found fixing broken machines and performing preventative maintenance. His wife, Barb, records conditions in the clean rooms to begin the next day. The machines at Haemonetics were humming. Beads of plastic resin slid in through overhead hoses and were heated up and molded into various shapes. Components were attached together. More than 100 people scurried around the factory floor, minding their tasks. All the time, a production counter loomed overhead — constantly clicking toward the daily goal of 63,000 bowls and 48,000 bottles. Barb Greshauk, the sole quality technician working for Haemonetics at night, made her rounds to different cells — bright, sterile rooms walled off from the rest of the factory. 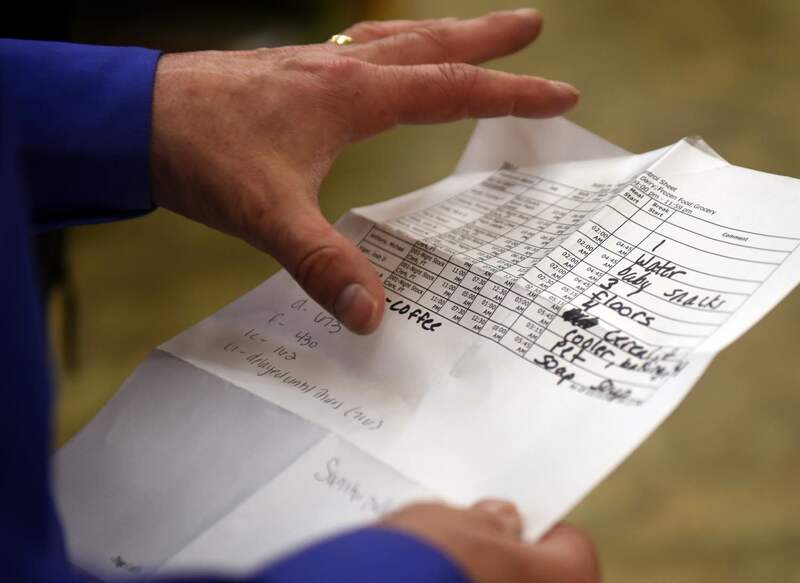 She gathered temperature, humidity and pressure readings to mark the beginning of the day and carried a stack of paperwork that was handed to her not long after she clocked in six hours before. Barb Greshauk works through required quality checks of Haemonetics' plastic products. Ms. Greshauk was looking for “nonconforming events” — blemished products that she must stop from leaving the factory. She pulls a sample of each product every night and inspects it. Workers on the assembly line also bring them to her. One that she got this shift: a plastic bowl that spins to extract plasma from blood had a small bubble in a piece of the core. Though it was a cosmetic problem, the slightest error in one of the components could throw off blood tests or cause recalls. Meanwhile, Russ Greshauk, a mechanic, walks through the operation and fixes issues as quickly as possible. “You have a room of people who are sitting there waiting on you to get this machine up and running,” he said. Tom Whyel, an overnight worker for the Port Authority of Allegheny County, heads to a bucket lift so he can replace burnt bulbs at a Port Authority parking lot in Wilkinsburg. Tom Whyel travels through the city like few others can. Taking off in a bucket truck from the Port Authority’s South Hills Junction on Warrington Avenue, he breezed through the dreary Mount Washington Transit Tunnel, crossing trolley tracks onto the Smithfield Street Bridge. He connected with the East Busway and zoomed above the Strip District, far below the Bloomfield Bridge, past the glittering high-rises of East Liberty and Shadyside. 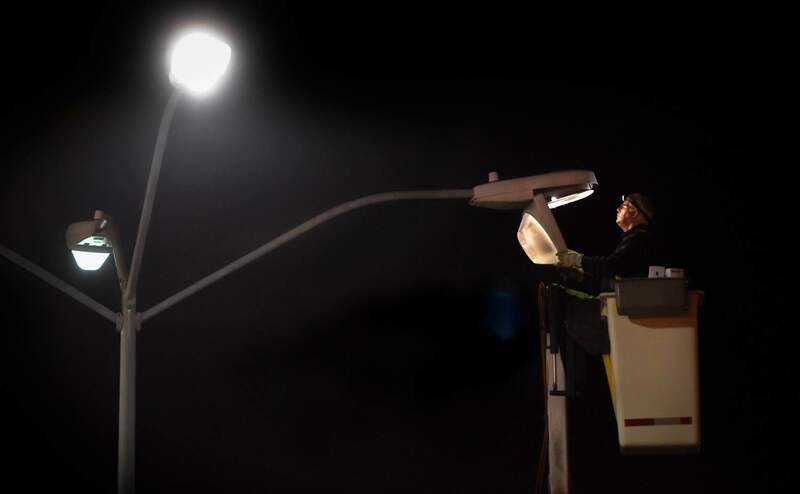 Tom Whyel, an overnight worker for the Port Authority of Allegheny County, checks a streetlight bulb. Wheyl's job on this night was to replace burnt bulbs at a parking lot in Wilkinsburg. 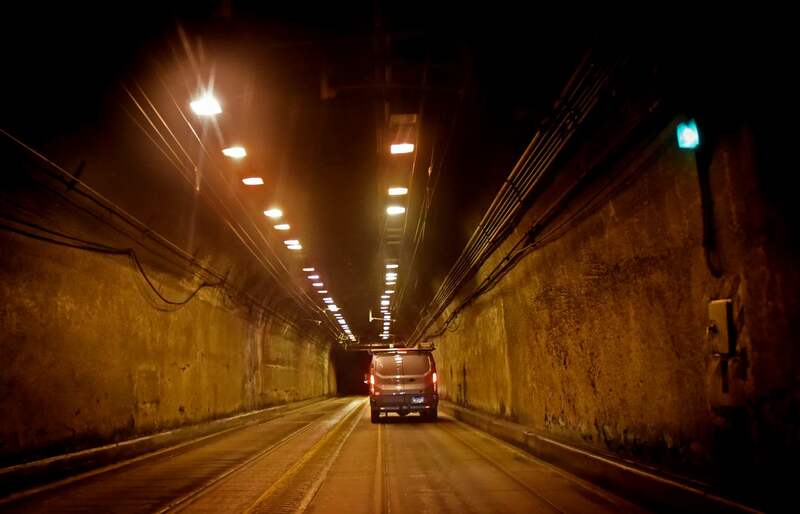 Tom Whyel drives through the Mount Washington Tunnel en route to a job site in Wilkinsburg. He stopped in Wilkinsburg and surveyed the park and ride lot with a frown. For the Port Authority, darkness is a liability that must be extinguished. And ensuring that every bulb works in places where people congregate or walk to their car is more important than having well-lit roads or tunnels, he said. “I don’t like what I see on these light posts,” he said, opening up the back of this truck. Tom Whyel guides a bucket lift upward so he can replace burnt bulbs at a Port Authority parking lot in Wilkinsburg. The day before, Mr. Whyel, wearing his North Braddock borough manager hat, had been investigating a complaint from an elderly woman that an uneven sidewalk had caused her to fall while leaving a fish fry. He also had a meeting with the police chief. He showed up at a Boy Scout meeting, where he’s been a Cubmaster for 25 years. Just before 11 p.m., he arrived at the Port Authority’s junction, a cluster of maintenance buildings where the night workers huddle. He set off with a truck full of bulbs, a box of tools and a cooler with his lunch. 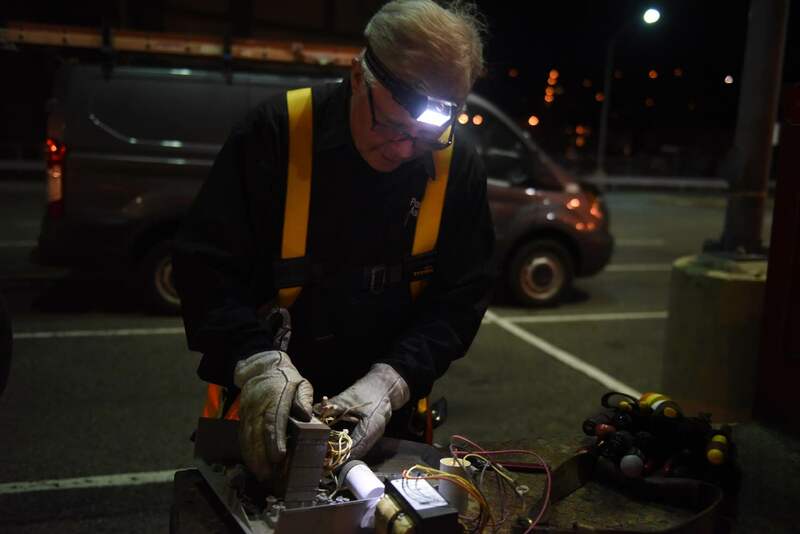 Tom Whyel makes a repair to a light fixture at a Port Authority parking lot in Wilkinsburg. If the problem is deeper, he has to detach the fixture and bring it down to the truck. That can add at least 30 minutes to a job. Animals are a pesky issue, too. At the East Liberty stop, rodents had gotten into the conduit and chewed on the wires. On this night, his luck ran out eventually. Around 1 a.m., a socket issue forced him to bring down the fixture and grab some tools from his truck. To avoid injury during the 12-hour shift, Barb Greshauk and her colleagues stretch out. At 4 a.m., she said, she often resorts to loud music and walking around to stay focused. For many night shift workers, there comes a time when they begin to drift. Night workers interviewed for this story insist they don’t feel like they lose focus when performing a task that requires concentration or is dangerous; it’s the tedious parts of the night that have an effect. The top industries working between 9 p.m. and 5 a.m. range from food service to utiliy workers. The finance and education sectors have the lowest percentage of overnight workers. “There is a physiological cost to being a night shift worker,” said Nathaniel F. Watson, professor of neurology at the University of Washington in Seattle and also a former president of the American Academy of Sleep Medicine. When they leave work in the morning, he added, shift workers should go to sleep right away. Wearing sunglasses on the commute home in the morning and putting blackout shades in the bedroom can help them ease into sleep. Shift workers described feeling exhausted at the end of their shift, but some stay up anyway. Overnight, from 9 p.m. to 5 a.m., 3% of the population are working, while 74% are sleeping. Some, like the Greshauks, choose to stay up to finish home improvement projects, sometimes to the point of “feeling like a zombie.” Mr. Kelley, the Gateway Center cleaner, said he wails on one of his 11 electric guitars or plays video games for a few hours before dozing. “What we’re doing is unnatural — we’re supposed to be asleep, and your body knows that,” Mr. Kelley said. “So there comes a point every night where your body says that’s it, you’re done.” By the time he gets on the bus at 6:30 a.m., he said, he is “really noodled out.” He wouldn’t trust himself to drive a car. Are you enjoying this special report? If you are, consider subscribing. Tom Boyle, the overnight senior team leader at the South Hills Market District, wraps up an unusually slow shift. But the next nights are "probably going to be hell,” given a larger-than-expected delivery. With time running out until a wave of morning shoppers arrives at Giant Eagle’s top store in the region, Tom Boyle was on his knees in the frozen food aisle, helping one of his employees break down boxes. It had been a relatively smooth night, by his account, with his staff of about 30 people handling incoming truckloads of products and filling up the shelves smoothly. But Mr. Boyle, store manager of the South Hills Market District store in Bethel Park for five years, was well aware of the vagaries of the grocery store supply chain. He knew this shift had been light because snow halted a truckload of orders from Unified Grocers, a distribution company that would have to send it the following night. Mr. Boyle, with a breathless cadence and the disciplined personality of a sports-team captain, used to own a business making and selling neon signs. Seeing no future there, he interviewed at O’Hara-based Giant Eagle and was offered the store manager position. Tom Boyle checks a list to see what his crew of 30 people must do each night. He walks as far as 18 miles from 10:30 p.m. to 7:30 a.m., preparing Giant Eagle's top regional store for the morning rush of shoppers. He learned the job quickly, he said, and can now spot unusual holes on the shelves, anticipate seasonal orders and examine wear and tear on the store that may need to be fixed. He speaks in grocery store argot — pointing out end-caps, the shelves at the end of an aisle; bunkers, the open freezer containers spread throughout the store; and “blocking,” or bringing products to the front of the shelves so the aisles look like a long wall. “I worked one aisle, knew it in a couple days. Then I went to the next aisle, knew it. It was a progression, but I guess it’s like a playbook,” he said. In a typical shift, he walks as far as 18 miles. As the store began to buzz with activity, the meat counter display started filling up as workers cut slabs of beef and pork. The smell of blueberry muffins wafted from the bakery ovens. Though it’s open 24 hours, the store’s morning rush begins around 7:30 a.m., about the time the daylight managers arrive. Mr. Boyle refers to the end of the shift as a “finish line” that the night workers must always reach. And, in his five years, they always have.